In a new format we are producing videos offering tips and solutions to common problems in under a minute. In this free video tutorial we show you how easy it is to have more than one plug-in window open in Pro Tools. In a new format we are producing videos offering tips and solutions to common problems in under a minute. In this free video tutorial we show you how quick it can be to create new tracks in Pro Tools using the mouse. The idea of applying plug-ins to your tracks is to make things sound better but we've all overdone it at some point and without checking the before with the after we really can’t be sure we’ve achieved what we set out to. In a new format we are producing videos offering tips and solutions to common problems in under a minute. In this free video tutorial we show you how easy it is to fix issues in sounds using EQ in Pro Tools. Pro Tools Keyboard Shortcuts. There are just so many. Some are very well known, some really obscure but there is a middle ground of what I consider essential but in my experience aren’t as widely known as they should be. Here are six. You’ll probably know some of them. Do you know them all? If you are still using a HUI based control surface with Pro Tools and you find that the meters on your HUI control surface stop working then check out this article, we have the answer. In a new format we are producing videos offering tips and solutions to common problems in under a minute. In this free video tutorial we show you how easy it is to accurately measure the tempo of audio in Pro Tools. In the pursuit of increasing the I/O count on a Pro Tools HDX system we have discovered the second hand value of Pro Tools HDX related Hardware is at an all time low. Some second hand grey face Avid HD I/O units are in fact being sold for a lot less than you would first think. We buy a used Avid HD I/O 8x8 for quite possibly the lowest price ever and explain our reasons behind it. Julian considers changing how he uses tab in Pro Tools after being reminded of a useful keyboard shortcut on an Editors Keys shortcut keyboard. In a new format we are producing videos offering tips and solutions to common problems in under a minute. In this free video tutoria we show you how easy it is to create reverse reverb using an AudioSuite plug-in. No sound from Pro Tools on your Mac? Here are somethings to try to get things working, in under a minute. Avid’s Heat mixer plug-in sounds great but the fact it is only available on Audio Tracks makes it difficult to use properly if you use lots of Virtual instruments. Is there a viable workaround? In this free Pro Tools tip, Pro Tools Expert team member Julian Rodgers shares a method for quickly identifying the MID CC number of an encoder on a MIDI controller. Pro Tools groups are one of the most powerful tools available when mixing in Pro Tools. The ability to nest groups of tracks within multiple, overlapping groups offers control far beyond that available using submixes and the addition of VCA faders brings huge control. Something which many overlook is the presence of little dots next to the groups in the groups list. What do they mean? Watch the free video and see the difference in action. Trimming to the boundary of the next clip on the timeline should be easy, and it is. The necessary commands are found under the edit menu. See the comments on the images in the slideshow to see the options. Selecting all the clips on your timeline should be simple but unlike many pieces of software, using the standard CMD+A (Control+A on PC) doesn’t select all the clips on every track, it selects all the clips on the track your selection point is currently on. 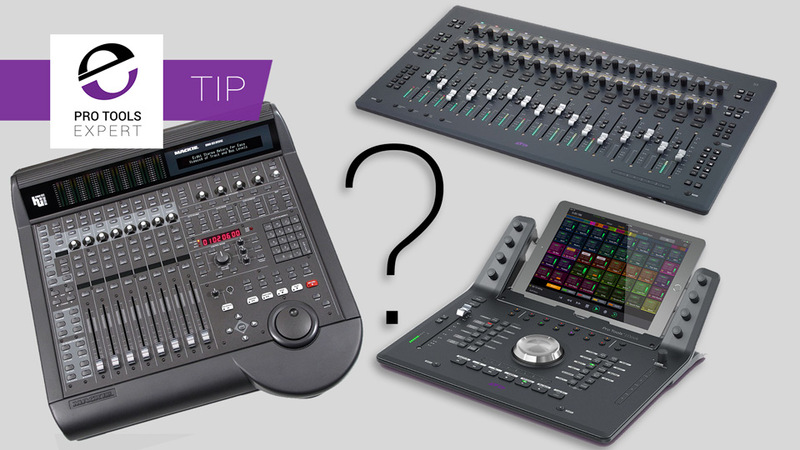 This is a very simple free tip for Pro Tools Ultimate/HD users who have access to advanced automation. Write To Start/End or All by right-clicking. Pro Tools expert Team member Julian Rodgers shares a free tip which makes managing the record status of groups of tracks much simpler by using VCAs. In this tip Pro Tools Expert team member Julian Rodgers shares a simple but indispensable tip in what is probably his shortest video to date.